In spite of this remarkably unromantic beginning, Temecula has started to come into its own, and some vintners are crafting wines of real distinction. Because of cool breezes from the Pacific funneled through a gap in the mountains, it turns out Temecula vineyards can do a lot more than look pretty for suburbanites. As I wrote in this post, Temecula’s tasting room experience still has some growing-up to do. A number of venues still gear themselves to birthday and bachelorette party groups looking more to get a buzz than experience beautifully made wines. But at some Temecula wineries and tasting rooms do focus on the wines, as opposed to getting drunk, and many of these are showing off some very fine wines indeed. I started my second day in Temecula at Hart Family Winery, mostly because its tasting room opened at 9:00 a.m., an hour or two earlier than everyone else’s. 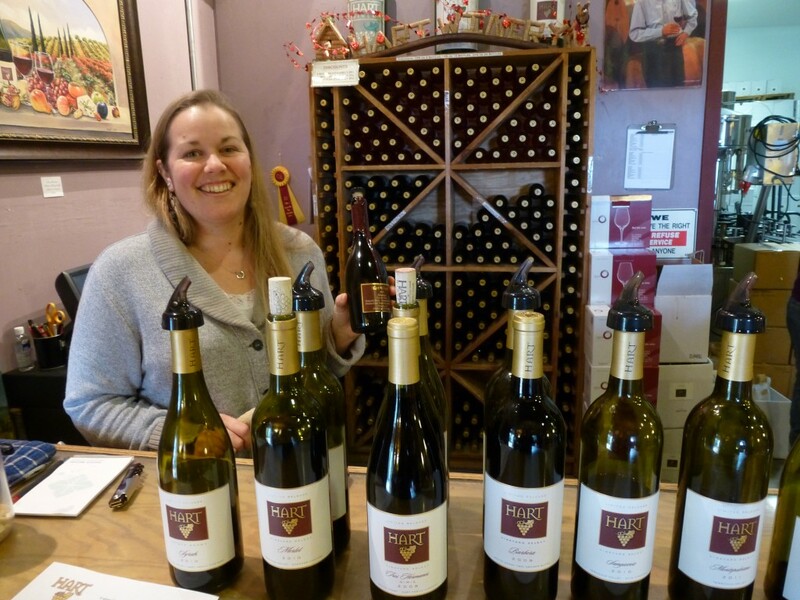 I felt a bit apprehensive, I must admit, after the previous day’s unpleasantness, but Hart’s tasting room was small and quiet, and it offered tastings for half the price of Ponte. And the wines weren’t too shabby either! 2011 Roussanne: Rhône varieties seem to do well in dry, sunny Temecula, and this Roussanne was no exception. It had a green, juicy aroma, juicy fruit and acids, and it ended on a clean mineral note. 2011 Cabernet Franc Rosé: I’m a sucker for good rosé. This example was fruity and fun, with some lemony acids and a touch of stone. Works for me! 2011 Montepulciano: Temecula’s Italian varietals also tended to taste great, including this lovely little number. I liked its nose of earth and raspberries, its ripe red fruit and its food-friendly acids. 2010 Sangiovese: I thought for a moment that I might be in Tuscany when I sipped this brick-red beauty. It felt focused and earthy, with well-balanced acids and an irony finish. 2009 Tres Hermanos: This Rhône-style blend of Grenache, Mourvèdre and Syrah had tightly wound, plummy fruit and hearty tannins. It had me hankering for a bowl of ratatouille. 2010 Syrah: I didn’t detect too much bouquet here, and the wine felt a little tough. I bet it would benefit from some decanting or some additional age. 2010 Aleatico Port: I felt especially excited to try this port, made from the very unusual Aleatico variety. This grape, a red relative of Muscat, originated in Italy, where it’s grown mostly in Lazio and Puglia, according to The Oxford Companion to Wine. The island of Elba also exports a sweet red wine made from Aleatico, and the grape is “surprisingly popular in the central Asian republics, notably Kazakhstan and Uzbekistan,” the Companion notes. I still don’t fully understand how this odd duck of a variety ended up in Temecula, but there it was. The port had a thrillingly rich, raisiny aroma and a beautiful dark magenta color. It started sweet and smooth, then moved to an intriguingly chalky midsection before finishing with a surprising blast of spice. Delightful! There’s nothing like a good port right after breakfast. Feeling much restored, I set off towards my next tasting. It proved to be the complete opposite, in every way, from the craziness of Ponte. Up Next: An unexpectedly private tasting at Wiens, some intense focus at Palumbo, and sipping amid the motorcycles with vivacious Marcello Doffo.